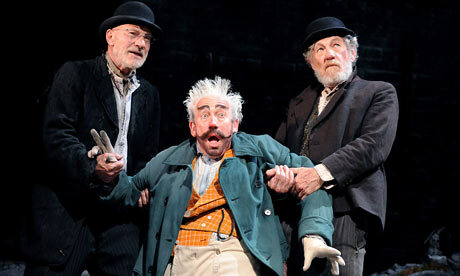 The Guardian is offering its readers a bluffer's guide to the current UK revival of Beckett's Waiting for Godot. The production is currently playing the Haymarket Theatre in London, and has attracted a number of warm critical reviews, with even the occasional celebrity guest. You can read Leo Benedictus's bluffer's guide online by clicking here. Alternatively, you can read Michael Billington's review of the show here, or Susannah Clapp's review here. Billington's article explores the use of slapstick and music hall comedy in the latest run, which sometimes serves to weaken the overall impact of the play; nonetheless, Billington still finds something profound and emotionally-involving in the performances. Clapp is similarly aware of the production's weaknesses, but spends more time conveying its strengths. She summarizes by declaring that the familiar 'Beckettian' formula offers, in this case, ideal ingredients for a West-end success. Interesting stuff!